Something you may or may not know about me, is that I absolutely LOVE going to the theater. Love it. I've seen a lot of shows on Broadway, London's West End, and a few traveling shows (and even one in Vegas) and they were all incredible! I love musicals, but I truly just love the way the theater makes everything so magical. They make everything so vivid, even without elaborate set changes and only a small number of people to play dozens of roles! How do they do it?! About 18 months ago, I (along with most of America) became OBSESSED with the Hamilton soundtrack. It's one of the most innovative things I've ever listened to in my entire life. I knew I had to see it live. With our month in NYC approaching, I knew I could try for the lottery, but it was unlikely I'd win. So in June, I took matters into my own hands and bought tickets --- for March 2017. Yes, a solid 9 months in advance. So I knew we'd have an NYC trip for my 31st birthday! SO yes, that's the entire reason we booked this trip. We had a home exchange we needed to use up anyway, so it was the perfect time. And if you have the chance to buy Hamilton tickets, do it. One of the best I've seen! The view from our 41st floor TriBeCa apartment was incredible! I've never had such a great view of the city. New favorite brunch place - Maman TriBeCa. Such an inventive menu. The decor was very French Country but done so beautifully. More of our view - we could see the sunrise over Brooklyn. Amazing! Other new favorite brunch - Bubby's. Apparently this place has been here a long time, and there's a reason. Get the pancakes. You won't regret it! (because I regret not getting them) Their huevos rancheros was also one of the best I've had! We had dinner at VBar Seaport and it was delicious. They had a great mezze plate and pasta, it was perfect for a rainy, cold night. Our trip was awesome. The weather wasn't my favorite (40 and rainy), but that's "spring" for you. I did all of my favorite New York things - saw a show, got my nails done, had bubble tea, wandered downtown, had pizza by the slice, saw friends, and ate and drank a lot of great stuff! Today I'm here with a little something fun - I'm giving away a 4 Piece Travel Set from West Elm! I use this set myself and it has served me well. 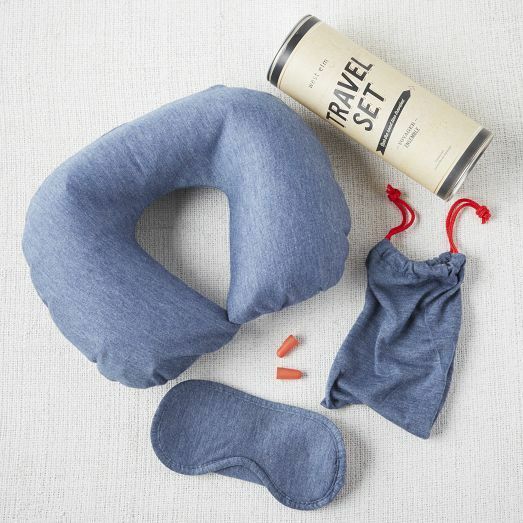 I love that you can inflate/deflate the neck pillow, so you aren't stuck carrying it around for your entire trip. The eye mask is incredibly soft. And the little drawstring pouch fits everything inside for easy packing! Good luck! The winner will be announced on Monday. We recently road tripped to Memphis to complete our Global Entry Interview & take a bonus pit stop at Ikea. Once I started researching Memphis (I've never been! ), I realized that we had to stay at the Peabody Hotel. It's super old and historic, has gorgeous high ceilings, and has the DUCKS! There's a whole history around this, but there are ducks that live at the Peabody. They live upstairs on the roof in a special duck penthouse, except every day from 11am-5pm where they live in the fountain in the lobby. They march into the elevator when they hear the John Phillip Souza march - it's adorable! If you are going to see the ducks (you don't have to be a hotel guest to go! ), I suggest getting there at least 45min-1hr in advance and grab a seat. You can't be standing unless you're behind certain areas. We snagged a seat at the bar and had a drink while we waited for the little quackers to do their march :) I loved it!!!! We ate dinner at South of Beale and it was so good! It was located in the arts district about 1 mile from the hotel & Beale St. It had a lot of vegetarian and non vegetarian options. It was casual, had a good beer list, and they give you this incredible popcorn (that I think might be laced with crack) when you sit down. I would definitely eat here again. Matt's side of mac & cheese was absolutely delicious! We had a drink at the ultimate dive bar - Ernestine & Hazels. This place was a brothel back in the day, and it definitely hasn't been updated since. Like Santa's in Nashville, they serve 4 or 5 different type of bottled beer. It was awful and awesome all at the same time. Beale Street, or Memphis' version of Broadway in Nashville, was underwhelming at best. This photo was taken around 10:30pm on a Saturday night - I couldn't believe how few people were out and about! The street is blocked to cars, so pedestrians can wander in and out of bars. Many of the bars were charging a $10 cover, so we didn't head into any. But if you wanted to hit up some live music, this is the place. Have you ever been to Memphis? Did you see the ducks? What did we miss?